If you’ve been keeping up, you know that this is the sixth (and perhaps final) installment in my series on Rubberizing Agility Contacts. I have stuck (no pun intended) strictly with the Rubber on the Run process developed by Darlene Woz, as documented in the book “Making Rubber Skins for Agility Equipment“. The Bay Team and SMART equipment committees collaborated on this effort, since we share so much equipment at our Prunedale trials. The committees further determined that, though the rim of the chute should be padded for protection, it should not have traction. Rather it should be “slippery” and not involve a surface that would catch the coats of larger dogs. Thus, we decided not to fabricate rubberized rims for the chute, and instead adopted what SMART had already implemented on one chute – a “pool noodle”, slit vertically with an electric carving knife, and affixed to the top half of the chute with Zip-Ties (photo to come, I promise). I encourage you to print this page and insert it as Errata on pages 21-23 and 28-29 of the book, for both the tables and the chute. I mentioned earlier that despite purchasing only 6 chute kits and 8 table kits, we managed to produce 7 chute mats and 12 table skins because of design changes. Now you know how: we eliminated the table sides and chute rims, carefully recalculated and reweighed the rubber and binder (which was way too much fun, as Katrina and Karey demonstrate), implemented mass production tactics, and just kept forming skins until we ran out of rubber. 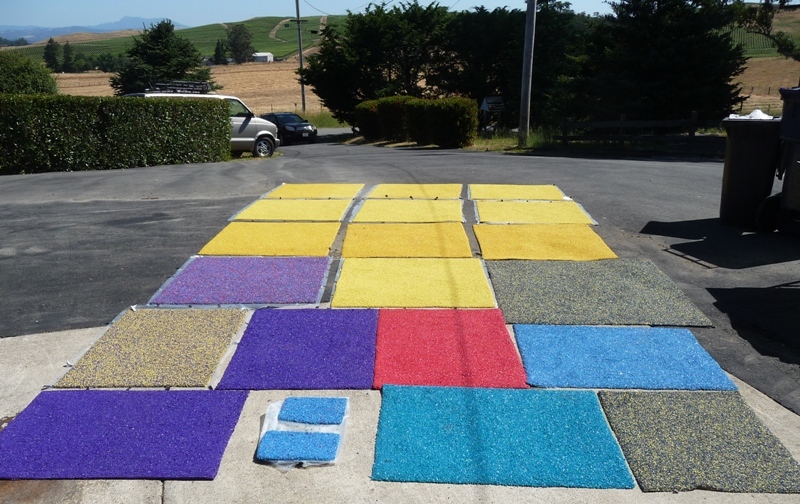 We combined pellets at the end, which gave us a custom purple/yellow chute mat to sell (2nd up from lower left) and the coveted “confetti” table mat (mid-left), which Katrina happily claimed as her own! The two stray pieces at the bottom were custom made from scraps for Karey’s in-cabinet dog door path. Northern California agility dogs are happier because of our efforts. The tables and chutes made their debut at the July 4 Bay Team trial last weekend. I wasn’t there, but as I understand the feedback, the deafening silence of the dogs jumping onto the tables speaks for itself. The next phase of the operation, affixing pre-made skins onto the Bay Team and SMART contact equipment (A-frames, dogwalks and teeters), will take place in the South Bay over the next few weeks. The plan is to have all of the equipment upgraded in time for the August and September trials, including the Southwest USDAA Regional on Labor Day weekend. To Karey Krauter, Kate Wheelock and Katrina Parkinson (aka “The 3 K’s”), who gave up an entire Saturday to wallow in the most unbelievably nasty concoctions of solvent and goo. I’m still worried about Karey’s brain cells, after spending way too much time cleaning chutes with lacquer-thinner-saturated rags. To Katrina Parkinson (yes, she came back the next day) and Celeste Thomas, who showed up Sunday to glue, glue, glue. This time, it was Celeste who got to burn a few brain cells inside the chutes, breathing the heady fumes of DAP Weldwood Original Contact Cement. To my husband, Rich, who organized and cleaned out the garage to give us room for this preposterous effort, and stepped up as “day-of” errand-boy when we needed supplies because we were all too gooey to drive. This entry was posted on Saturday, July 10th, 2010 at 4:59 pm and is filed under Rubberized Contacts. You can follow any responses to this entry through the RSS 2.0 feed. You can leave a response, or trackback from your own site. Looking for small pieces of rubber skins that I can put on my dog walk/a-frame. Not looking to cover all of the contact. Need some especially for the a-frame as my Pap refuses to go up it at shows. Don’t have 500.00 to put in rubber skins for a complete A-frame nor do we have the facilities to make our own rubberized skins. Your help will be greatly appreciated.